Surgical repair is indicated for most hernias. All irreducible hernias need immediate evaluation because of the possibility of becoming strangulated. In some situations, surgery may be delayed or unable to be performed. Your doctor may prescribe trusses or belts to help keep the hernia reduced. People with hernias and those that have had surgical repair of hernias should avoid heavy lifting and other activities that cause high intra-abdominal pressure. What symptoms did you have when you had a hernia? Did you have surgery to repair your hernia? What was that like? What type of hernia did you have? Do you know what caused your hernia? 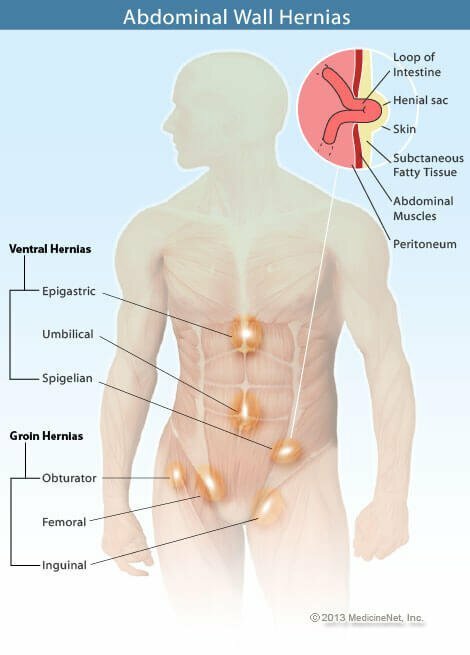 Direct and indirect hernia are both inguinal hernias. Both types of hernias may cause a visible bulge in the groin area. Weakness in the muscle of the abdominal wall causes a direct hernia. A birth defect causes an indirect hernia. Hernias that can't be pushed in need surgery. Hiatal hernia is a condition in which a thin membrane of tissue connects the esophagus with the diaphragm becomes week, and a portion of the stomach slides up into the esophagus. Causes include obesity, pregnancy, straining during a bowel movement, aging, and ascites. There are generally no symptoms of a hiatal hernia, and it is discovered during another medical procedure to test for GERD, or other swallowing problems. Hydrocele is a collection of clear fluid in a thin walled sack that also contains the testicle. Hydroceles are more common in males than females. There are two types of hydroceles: 1) communicating and 2)non-communicating. Hydroceles present at birth may resolve on their own. Hydroceles that appear in the teen or adult years may require surgery.